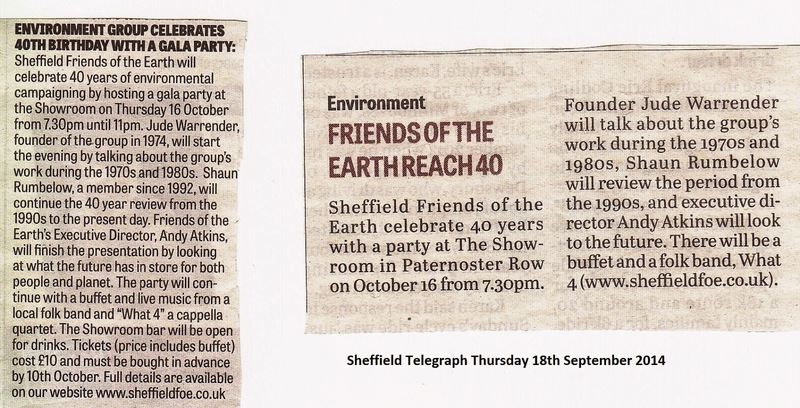 Emails to publicise our 40th birthday party have gone out to National FoE, SCA/SCACC, Beekeepers Association, Permaculture Group, SYEC, David Garlovksy, Transition Sheffield, Green Party, Sheffield Renewables, Greenpeace, Maureen, WDM, CPRE, and Sheffield City Council. Shaun sent a press release to the Sheffield Telegraph publicising the event. It was featured in the September 18th edition. Shaun has also been asked to write a 400 word article for the newspaper later this month. Tickets were distributed to members at the last meeting so they can be sold immediately when talking to people. If you haven't got your tickets yet then please get them ASAP. Ticket sales will end on Friday 10th October so we can sort out the catering.